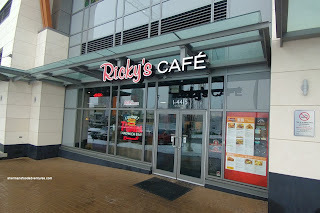 So this post about Ricky's Cafe fits into the same category as the recent one I did on Swiss Chalet. I'm no food snob, but there are certain restaurants that are never at the top of my list to visit (especially when there are so many interesting ones at the same price point or even less!). However, I've heard that some changes have been made and the food has gotten appreciably better (it's all relative right?). Things are particularly different at the specifically branded "Ricky's Cafe" located at the SOLO District. So yes, I grabbed the family and decided to give it a shot. 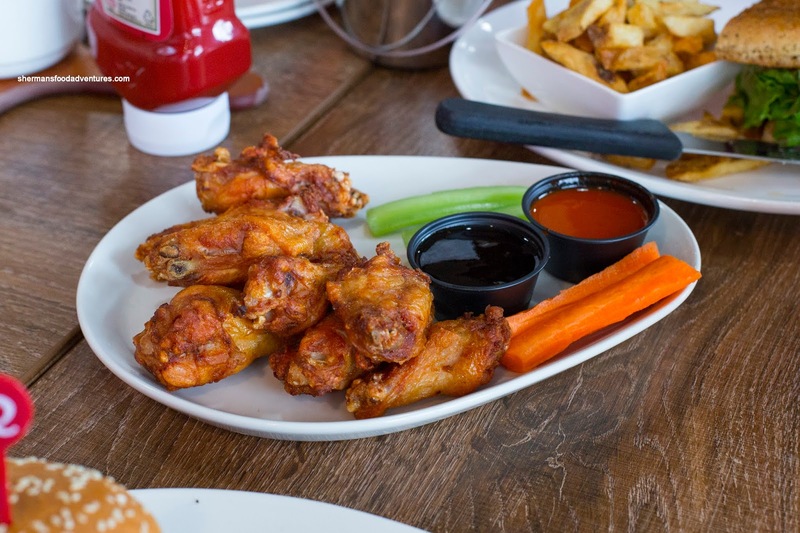 We got the Big Buffalo-Style Wings as an appie with hot and sweet teriyaki sauces on the side. These did live up to the promise of being big as evidenced in the picture. Fried up perfectly, the skin was rendered and crispy. Loved how the meat was still juicy and tender as well. Other than some Asian places, I find it difficult to find juicy fried wings at chain restaurants (they accomplished it here!). Nothing much to say about the sauces other than hot was typical and the teriyaki had quite a bit of ginger zing. For my daughter, she got the Kid's Lasagna, where she proceeded to eat it without letting me take a picture first (hence the messy appearance). This was pretty standard stuff with soft noodles in a meaty tomato sauce. There was lots of cheese on top (that you can't see because it had been mixed up). For myself, I went with the Radical Bacon Cheeseburger loaded with a 1/2 lb Angus patty, maple bacon, sharp cheddar crisp, melted sharp cheddar, lettuce, Windset tomato, onion tanglers and mayo. With all things considered, this was a solid burger. The meat was charred, yet not dry while the crispy onions added a nice texture and sweetness. 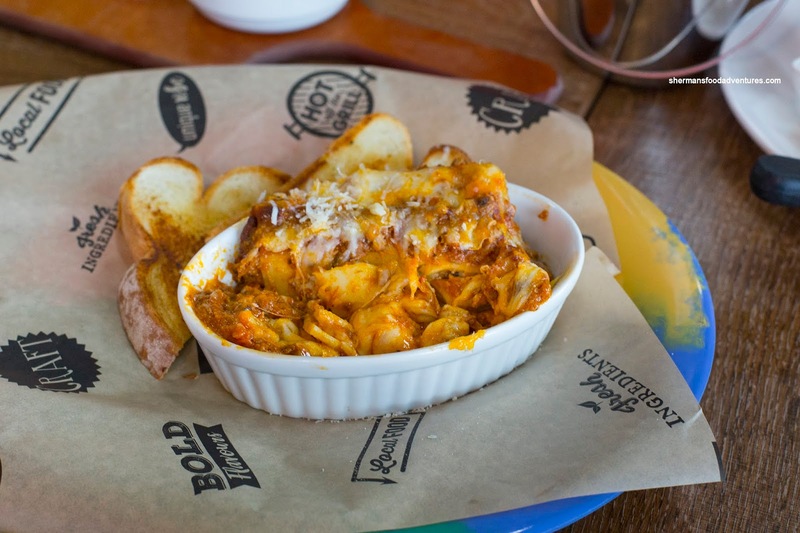 Lots of cheesiness to go around in terms of taste and messiness. Normally, chain restaurant fries are as exciting as doing taxes, but these Kennebec fries were legit being even par with fresh cut versions elsewhere. 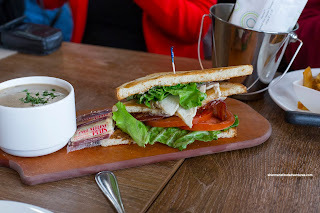 Viv decided to try the Chicken Cheddar BLT stuffed with chicken breast, maple bacon, lettuce, tomato and cheddar on focaccia. This wasn't very complex but things were prepared properly though. The chicken breast was moist and not dried out while the bacon was meaty and crispy. 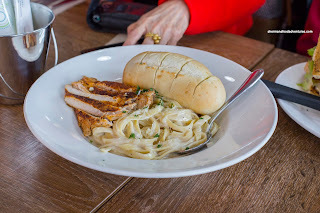 My son didn't do the burger or sandwich thing and decided on the Blackened Chicken Fettuccine Alfredo instead. The chicken itself wasn't blackened too aggressively, yet still was flavourful and slightly smoky. As such, the meat was still somewhat moist and completely tender. Noodles were on the softer side of al dente, but hardly overdone. Thick and creamy, the alfredo sauce was a bit one-note though. Interestingly, they were very generous with the loaf of bread, it was almost as big as the pasta. 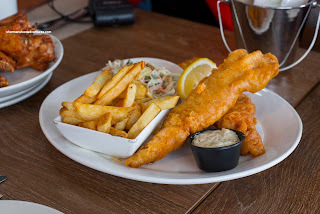 My dad opted for the 2 pc Beer-Battered Fish & Chips with coleslaw and tartar sauce. Being made-to-order with hand-dipped into fresh batter, the fish turned out very good. Moist and flaky with a thin crispy exterior, these were surprisingly good for a chain restaurant. Lastly, my mom had the lunch special consisting of a half Classic Clubhouse and a Cream of Mushroom Soup. Similar to Viv's sandwich, this was pretty good with tender slices of real turkey, the same thick crispy bacon and fresh produce. On the side, the soup was also good being creamy, but not too thick. It was full of infused mushroom earthiness and didn't rely on salt for impact. So as you can guess, I didn't mind the food at Ricky's Cafe. 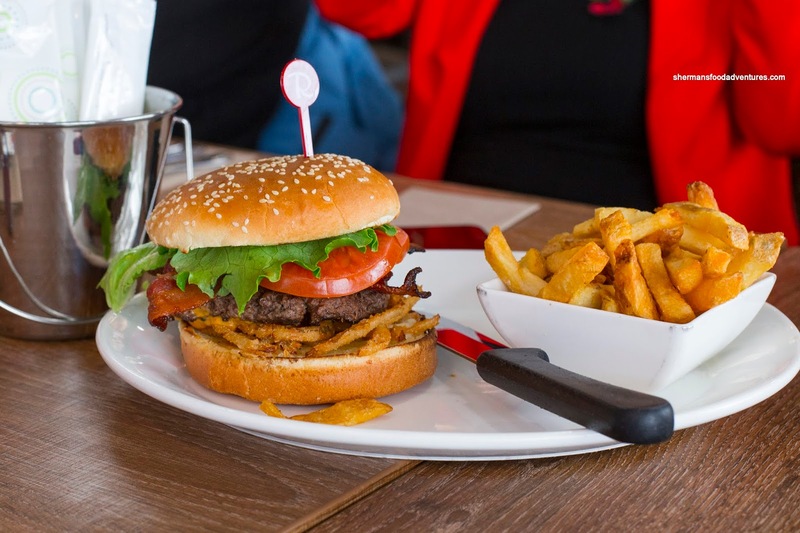 In fact, it gives Whitespot a run for its money and more when it comes to casual family-friendly eats. 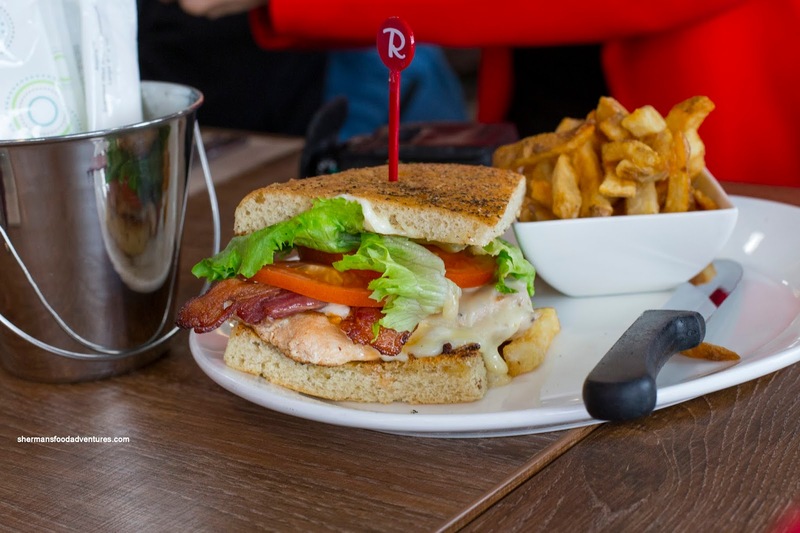 Sure, it isn't gourmet and neither will it replace more independent and interesting food options in the GVRD, yet it does provide decent eats for those wanting something familiar and convenient in the neighbourhood.